We had both buy and sell calls today and the strategy worked well. Please see the results below. Today levels worked completely in our favor and lot of calls did not get trigger which otherwise would have been loss making. L&T did not trigger. Buy above level was 980. Days high was 979.90!! TCS sell below level was 2045, days low was 2047 ! !, so the call did not trigger. Hero Motors sell below level was 1990, days low was 1991 !! so the call did not trigger. 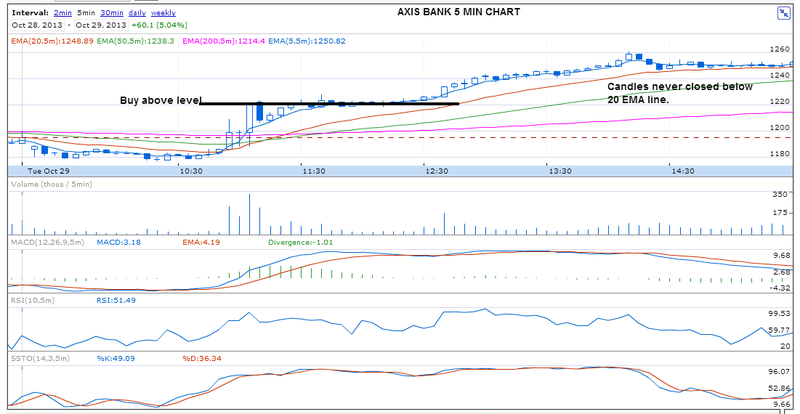 As you can see in the below Axis Bank chart, once the buy above level was crossed, the stock never closed below the 20 EMA in 5 min chart. In this case, we can hold one lot (half of the trade quantity) till the market close to maximise the gain. This is how trending market can be exploited. Nifty behaved exactly in accordance with the levels mentioned in yesterday's analysis. On the upper side, it could not cross 6175 and on the lower side, it touched 6100 and closed around that zone. For the trading on Oct 29, expect very high volatility. I will go long if the Nifty crosses at least 6150. Resistances are placed at 6175, 6200 and 6230. Above 6250, clear rally will start. 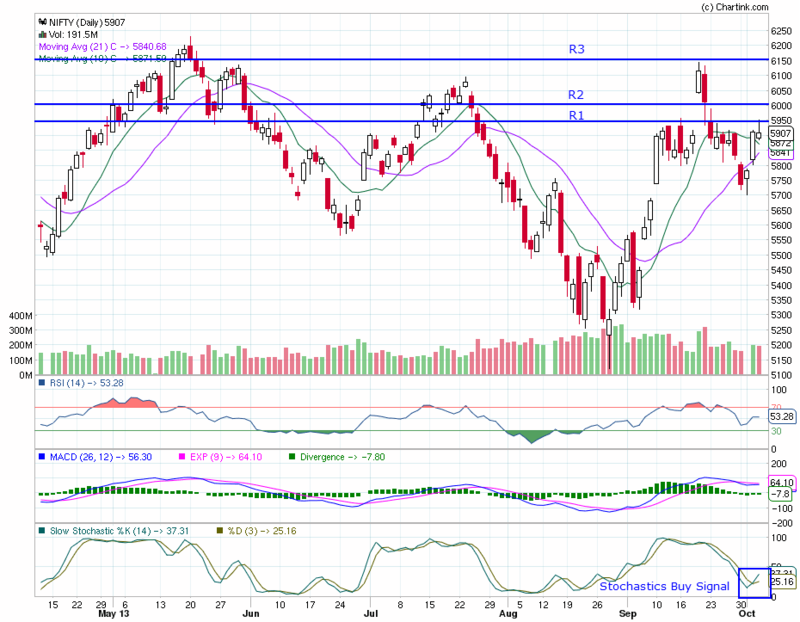 On the downward side, below 6050 (+/-10), Nifty will be bearish and will target 6000 - 5980. 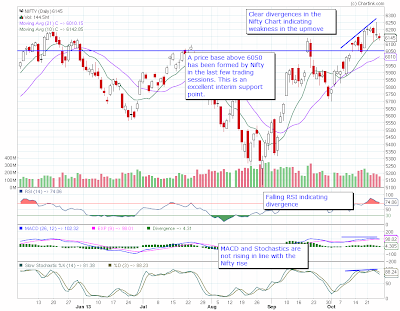 Nifty on daily charts is giving divergences showing weakness in the uptrend over the past few days. This week is filled with news and the big one the RBI Monetary policy announcement on Oct 29. Till then we strongly recommend to trade very lightly and do not carry any positional trades. For trading on Oct 28, Nifty below 6150 will be negative and next support level is placed at 6120-6100. Resistances are placed at 6175 followed by 6200. Market needs to again hold on to gains above the 6230-50 range to continue upmove. 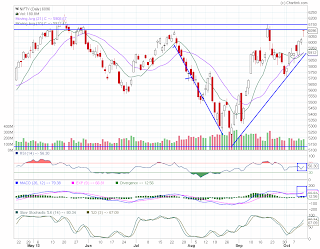 Till the day of the monetary policy announcement, Nifty is likely to be range bound between 6050 - 6250. Please trade realtime based on Opening Range Breakout / Intraday Trading systems explained in Trading Course. Infosys, TCS, Reliance and ICICI Bank could be traded on the long side. Bajaj Auto, Cipla, BHEL, Hero Motors, Tata Steel and Bharti could be traded on the short side. I wrote about stocks to buy for swing trading on October 14. Please read the original posts here - Which stocks to buy now. Here is what I recommend since most of the stocks have hit first target and market is at cross roads with key events lined up next week. 1. Tata Steel - Bought at 293 and then at 303. Target 324 attained. Book profits. 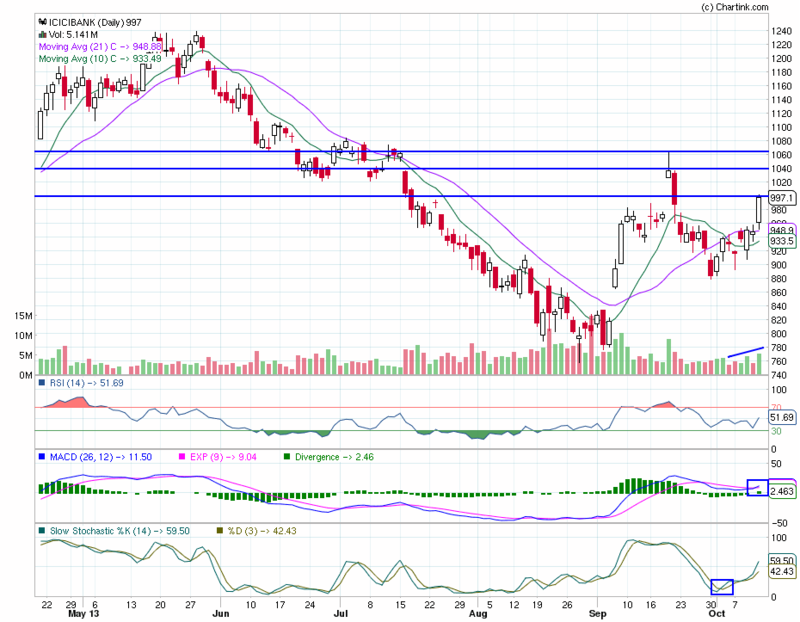 2 ICICI Bank - Bought above 1005, first target achieved 1040. Book partial profits and revise SL to cost. 3. Maruti - First target 1550 achieved. Hold with SL at cost. 4. L&T - All targets achieved. Bought above 900 and touched 3rd target 960. Now it is better to wait for clear market direction based on the RBI policy announcement on Oct 29. Our followers traded for 4 days this week and made Rs.20,000/- on pre-market calls. Details of Friday's trades below. Nifty should cross 6235 to remain positive tomorrow. 6250 is the next resistance, if broken next target will be 6300. Support is at 6200, followed by 6180. Below 6140, there will be heavy selling in the market. *Bajaj Auto - Sell on rise to 2110 with SL at 2125. 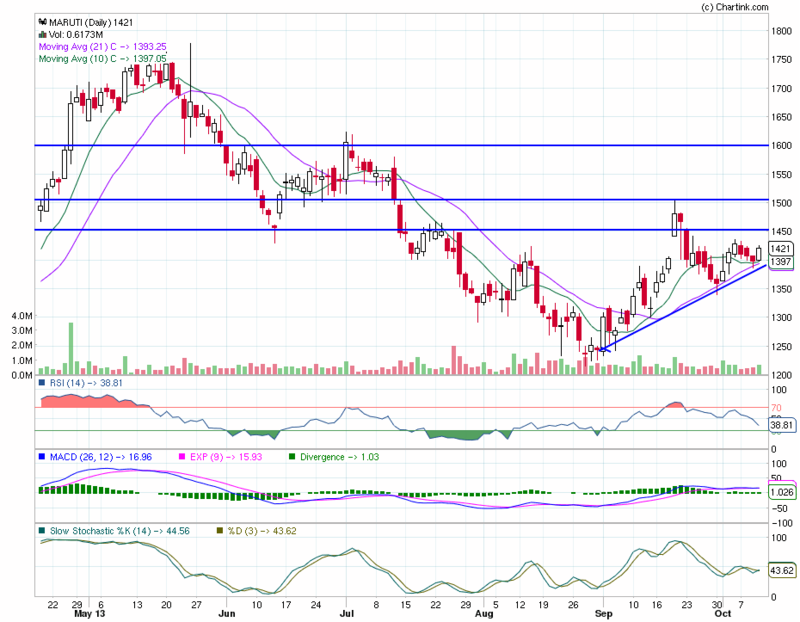 @BHEL - Sell on rise close to 141 with SL at 144. Market was very volatile and reversed the entire gains made during the initial hours. Our strategy of having both sell and buy calls for the day helped to be profitable end of the day. Please review the calls yourselves. We did not trade yesterday due to expected high volatility. Nifty could not cross 6230 resistance which we were writing here for several days and clearly crossed 6150 support level downwards , but bounced back to close above that level. This is not a good sign according to me. But only a closure below 6100 can confirm negativity in the market. Markets can correct any day and it happens when everyone else says the markets will rally. For intraday trading on 24, Nifty will be negative below 6170-50 range. Below 6120-6100 range exit all longs. To get back to bullish momemtum Nifty should cross and stay above 6230, this level still remains the same and crucial. If crossed below 6100, expect small bounce backs from 6080 and 6050 +/- 10 points. 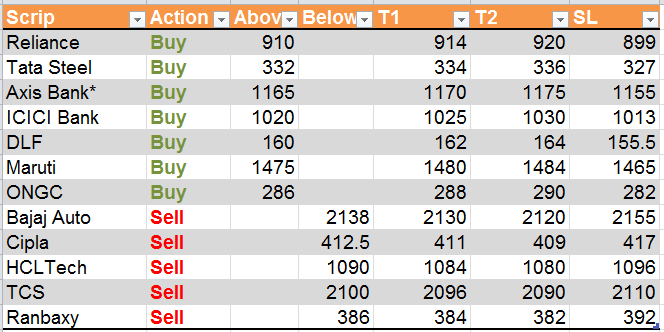 Today's profit from pre-market calls, 3 out of 3 calls success..
Nifty breached the critical resistance zone of 6150 which we have been tracking for several days and immediately moved up to cross 6200 levels on Friday. 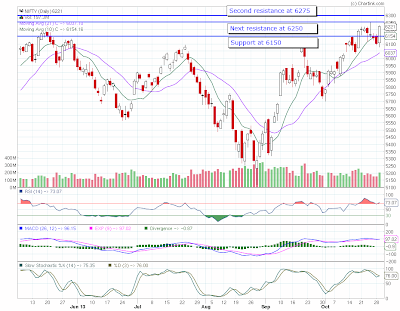 Overall, Nifty has entered into a confirmed upmove by crossing this resistance. In the coming days, please note that when Nifty moves closer to all time highs, there are chances of heavy profit taking. All positional small traders need to be cautious and should keep revising stoplosses upwards on profitable positions. 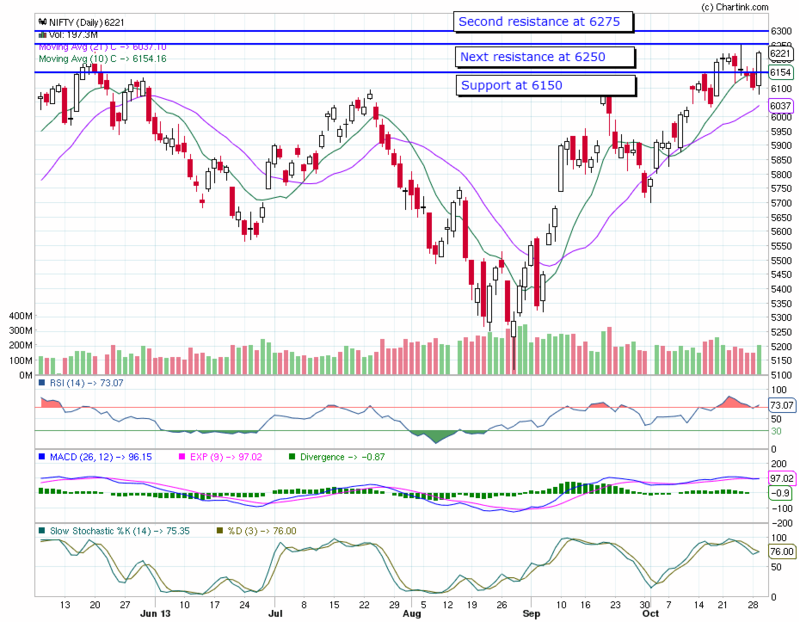 Immediate resistance for Nifty is at 6230 which is the previous swing high made in May 2013. If this level is cleared then next targets are placed at 6270. Supports on the downward side are placed at 6150-20 and 6100-6080. For tomorrow's trading, bullish momentum will be established above 6235 and resistances will be as mentioned above. Below 6150, market will have a negative mode. *Axis Bank: Fresh buy if Axis Bank sustains above 1175 for a target of 1180 and 1187 with SL at 1165. 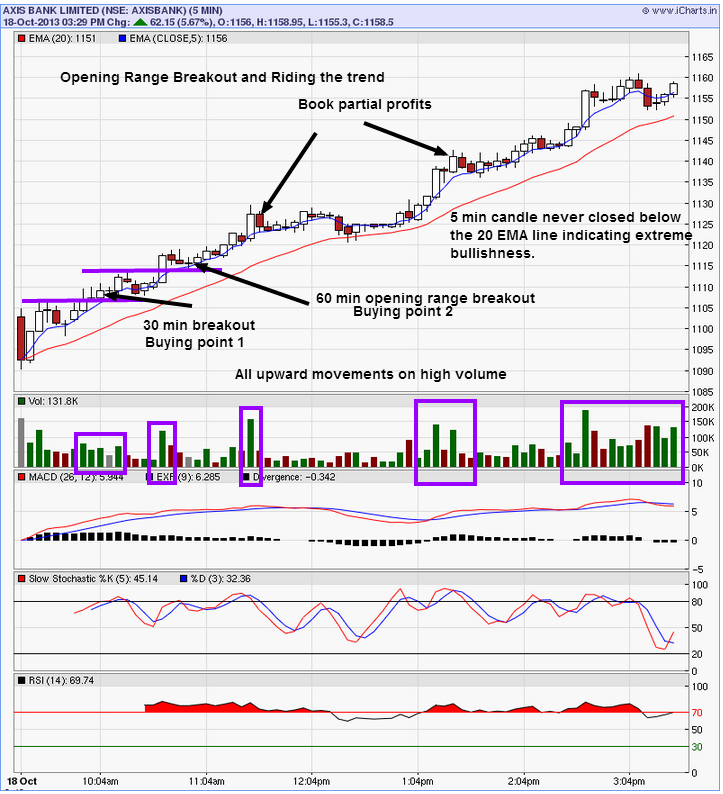 If you recollect my last trading lesson on riding the trend, the system was aimed at trading an opening range breakout at 30 min for quick profits and for riding the trending stocks (upward or downward movement consistently for the day) to maximise the profit. Please read the course lessons below. 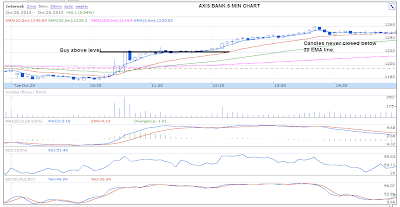 I did an excellent intraday trade on Friday (Oct 18) on Axis Bank which was trending steadily. If you see any such trending stocks during intraday time period, apply the rules of 60 min breakout for riding the trend. Please see the trade below and come back to me with any questions. Today our pre-market calls made a profit of Rs. 6,900/- from 6 out of 7 calls in profit. Hope everyone enjoyed. Please see the results below. If you have not read our unique Intraday Trading system, please read it under our free trading course. Today, we had an excellent sell trade on HCL Tech, which was a high probability sell trade as per our trading systems. 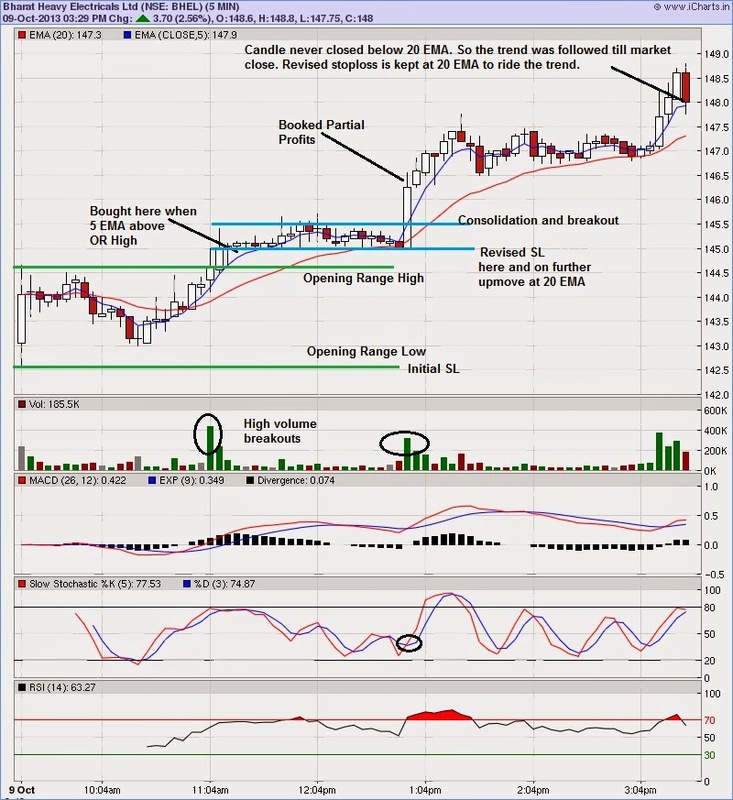 Please see the chart for more details on the trade. Please send your similar trades and we will publish here. As written in yesterday's pre-market call, below the zone of 6080-50, there was heavy selling and Nifty ended below the zone, any bounce back will be faced with selling with immediate resistance in this zone. A strong move above 6120 will give a positive momentum to the market. Nifty has turned bearish in the hourly charts, while in the daily charts the trend is still upwards. For the trading on Oct 18, Nifty will remain negative below 6050. Immediate supports are at 5080-6000 from where bounce backs are possible. Below this zone it is bearish trend for the day, please exit longs. Despite the market volatality and correction, our readers made money in pre-market calls. Please review the results below. Immediate resistance for Nifty is 6125 above which there will be limited positive momentum, High resistance and selling towards 6150. On the other hand if 6150 is held, then Nifty will further move up by 50-70 points. Support on the downside is at 6080-50, below which heavy selling expected. * Sell on rise to the levels indicated. Please visit our US Markets Page to learn about this trade. 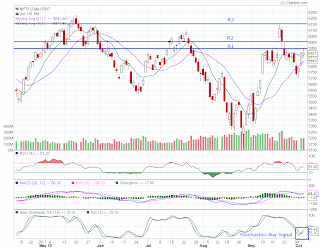 Nifty is facing resistance in the zone 6125-50. This needs to be cleared for the upmove to continue. 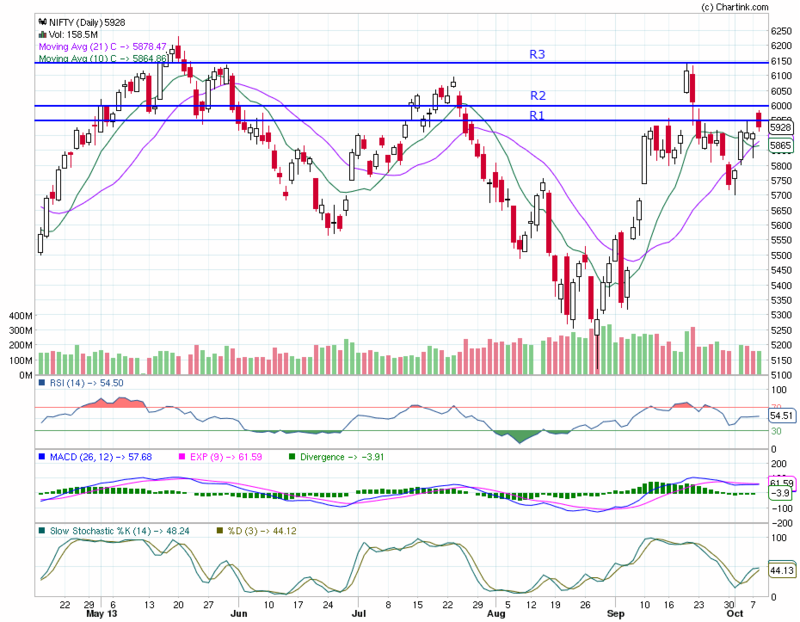 For the trading on Oct 15, Nifty will face resistance at 6150 followed by 6170-200. Support is placed at 6080, below which market will be negative. Nifty managed to make a sharp upmove on Friday to close at 6096. Strong rally above 1100-50 is required to confirm the upmove to 6300 levels. Next week is full of results from blue chip companies and will have impact on the Nifty movement. 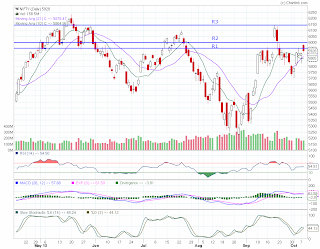 For trading on Oct 14, Nifty should be above 6120 for good upward momentum. Resitances are placed at 6150 and 6180. Below 6080, Nifty will be negative and longs should be avoided. As you would have already noted in other posts, we are long in Tata Steel , Maruti and TCS ( entered during market hours above 2100). Adding two more stocks for positional trading. 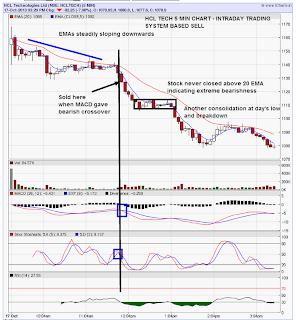 Weekly Charts - RSI bounced back from oversold levels. Stock closed above 21 week moving average with rise in volume. MACD crossover indicating buy. Daily Charts - Closed above 21 DMA. Upmove on increasing volume. MACD positive cross over, RSI bouncing from support. 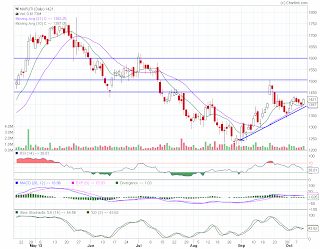 Buy above 1005 for targets of 1040-60, with SL at 945. Weekly Charts- Stock closed above 21 Moving average. MACD positive crossover. uptick in volume. Daily Charts - Moving average 10 above 21. 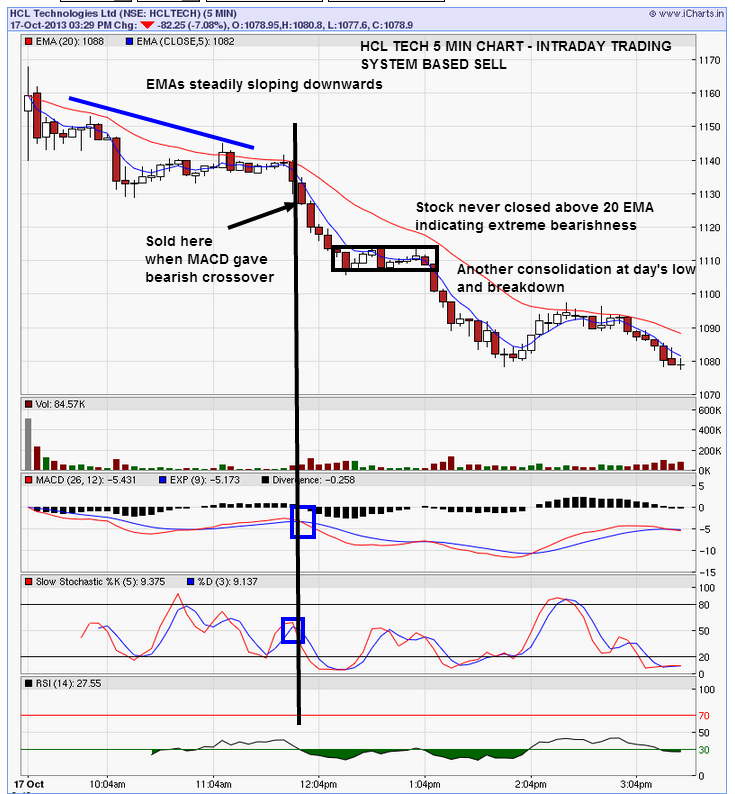 RSI bounce from support, MACD positive cross over, Stochastics buy and uptick in volume. 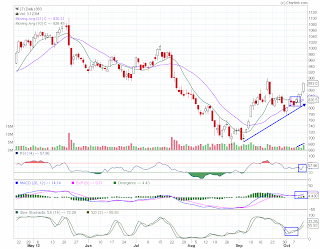 Buy only above 900 for a target of 920-40-60 with SL at 859. 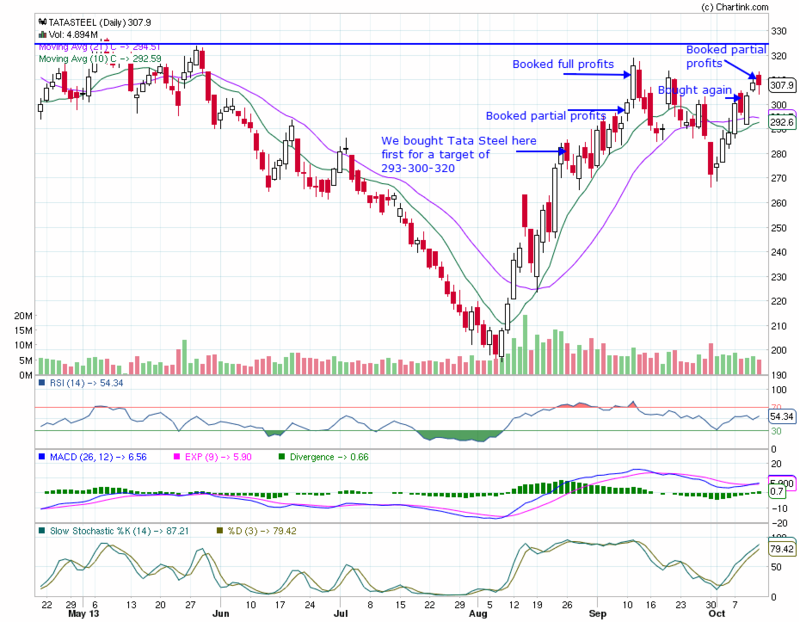 We entered into Tata Steel for a positional buy above 303. 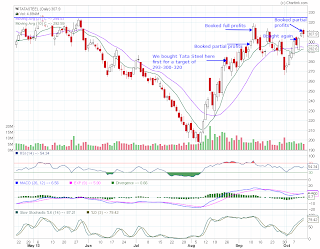 Tata Steel achieved our first target of 310. Positional traders, hold for a target of 320-25 with SL below 290. 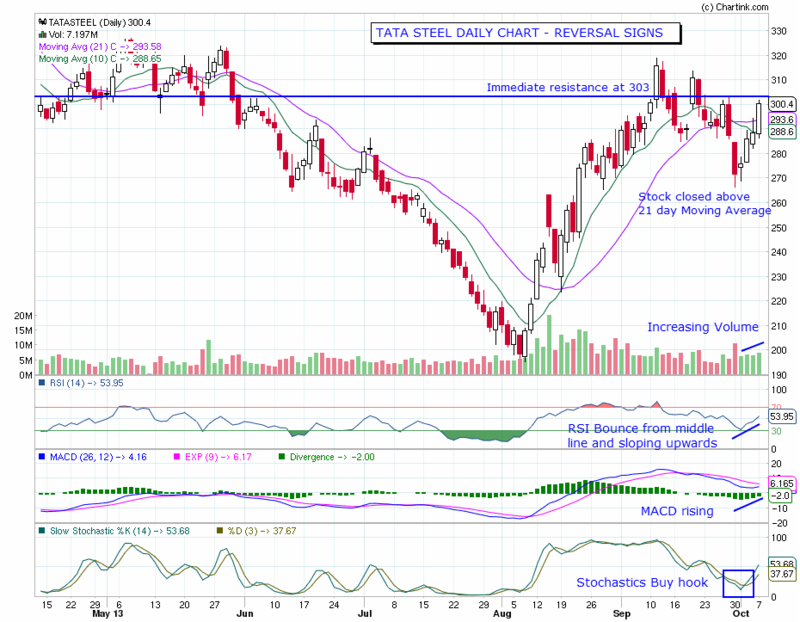 We have been trading Tata Steel from August very successfully. We bought at around 280 and booked at 300-320 fully. Our current buy call is likely to run until 325. If that resistance is crossed, fresh upmove will start. 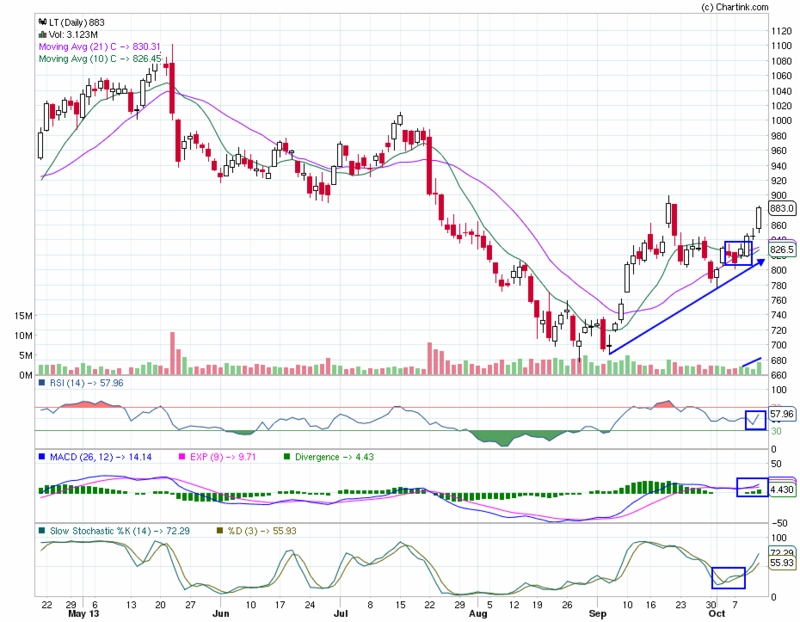 Maruti is technically strong and consistently bouncing back from 21 Day Moving Average. 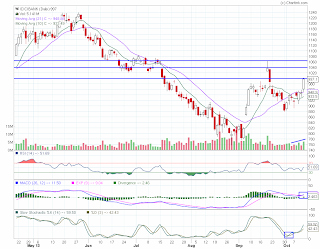 Maruti is now good positional buy above 1455 with SL at 1390 for a target of 1500-1550-1600. 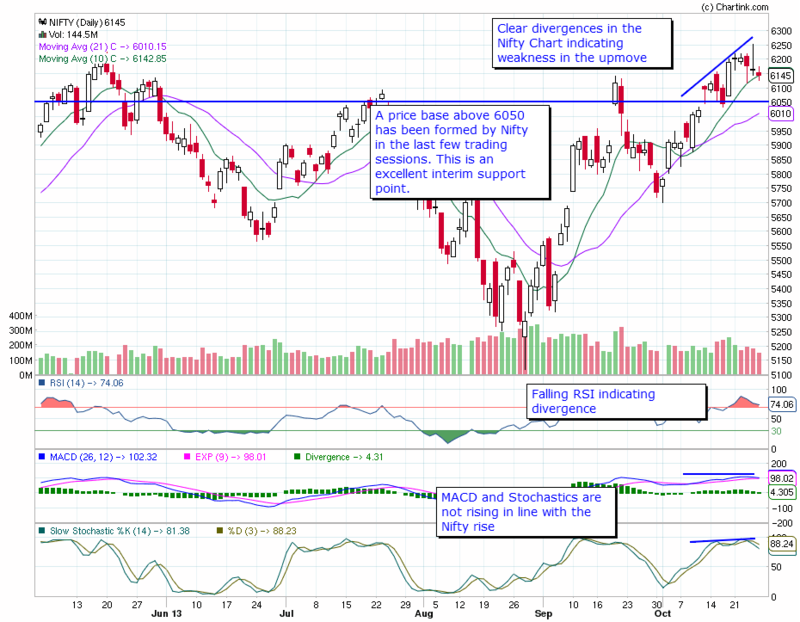 Nifty made a good upmove above the critical resistances of 5940 and 5980. Nifty should cross 6020 to remain positive tomorrow. 6050 is the next resistance, if broken next target will be 6080-90. Support is at 5980, below which selling will come. 3. 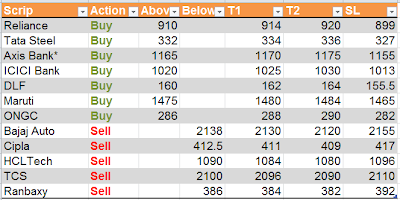 Those who are trading in futures, please trade with 2 lots and book profits close to T1. Dear readers, wanted to share one of the real trades which I did yesterday. Nifty was in continuous uptrend and BHEL gave a correlated move and did a breakout meeting most of the trading conditions as per our ORB trading system. 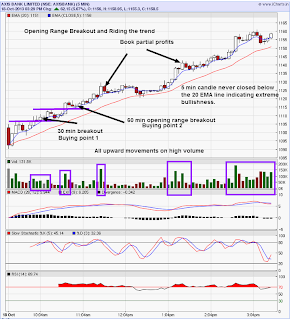 For those who have not seen our Opening Range Breakout Trading system, please read the below two course articles. Please see the picture below to understand the trade in detail. Please use contact me form in case you have any questions. We had majority of sell calls today in pre-market analysis since we were expecting negative markets. However good trade deficit data helped markets move beyond the key resistance of 5940 to be in the positive territory. Only 1 sell call triggered and hit SL. We made profits in two buy calls. In addition, there were real time alerts given in the chatbox for BHEL, Infosys and TCS - all calls in profits. Nifty was unable to cross the zone 5950-70 and sustain above that in today's trade. We wrote about this zone yesterday. 5980 has to be sustained followed by 6020 for a good uptrend. Today's move confirms that there is not enough momentum to take the markets above this level. Results season which starts with Infosys on Friday will decide the markets trend. For the trading on Sep 10, Nifty will be negative below 5940. Below 5900, markets will be very bearish and a fall till next support level of 5880-70 and 5825 is possible. Closing below 5820-00 will result in short term bearishness. None of the pre-market calls for yesterday triggered, so no profit no loss. So I will not be posting a seperate review. If the targets are met on opening , please do not enter the trade. We covered Tata Steel for positional buy few weeks back and the stock hit the target after which it started falling along with overall markets. 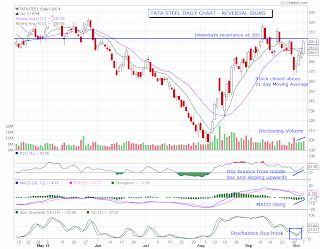 On Oct 7, Tata Steel made a smart upmove and closed above 21 DMA. Several indicators are pointing towards a bounce and next upmove. Buy above 303 for a target of 310-320. Keep SL of 286. Nifty will be positive above 5925. On crossing 5950-70 zone, Nifty will touch 6025. Sustaining above this could see 6050-70. Regular readers of this blog will know the next resistance levels for big positional move is 6100-6150. Today our readers had a fantastic day trading pre-market calls. 5 out of 5 calls were success giving a profit of Rs. 12425/-. Hope everyone made money. I had given Infosys as sell on rise and the stock behaved exactly the way we anticipated. I have detailed the trade below to give an idea on what "sell on rise" means. I myself did this trade based on the levels. Infosys - The trade recommended was - Sell Infosys if it cannot sustain above 3030 and falls below that level. The stock behaved exactly the same way. It went above 3030 and touched 3039. But it fell down and moved below 3030. A short entry was made at this time. Nifty crossed below our crucial support level of 5800 and touched 5700 which is a 100 point fall as written here before. However, there was a bounce back from that level. 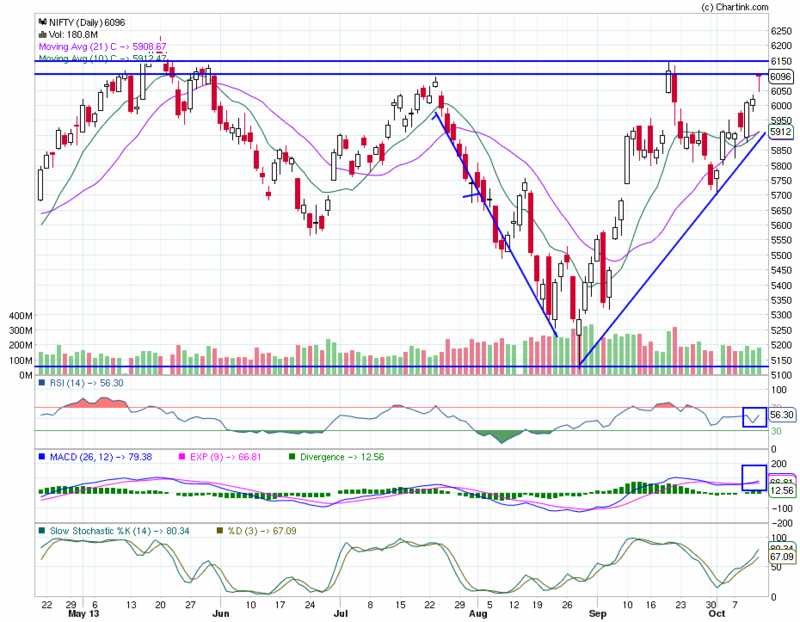 From the Nifty movement last week, it is clear that Nifty is facing tough resistance at 5950. This will be followed by a resistance at 6000. Short term trend will be up if Nifty crosses these levels and stays above. Real bullishness will come once Nifty crosses 6150. Nifty has turned buy in hourly and daily charts. For trading on Sep 7, Nifty will be positive above 5950 and bullish above 6000. So far 5880 is offering a good support for Nifty, below this level will be negative and heavy selling is likely to happen. Last week was a short week with 4 trading days. Personally, I traded only for 2 days due to high volatility. In fact, Friday the markets where very volatile so that any trade would have hit stop loss either on the long or short side. One important lesson which I learned - As a day trader you do not need to trade every day. A professional day trader waits patiently for a right trade, whereas an inexperienced trader chases stocks to trade. 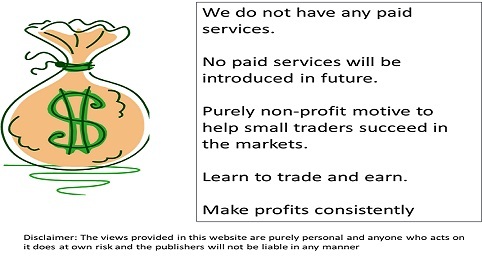 To earn profits consistently, you need to also practice to be in front of the terminal, but not do any trades. I have seen many day and swing traders holding more than 10 open positions which can only be disastrous if market reverses suddenly. I strongly advocate lesser number of trades which are technically correct and provides the right risk to reward ratio. 1. 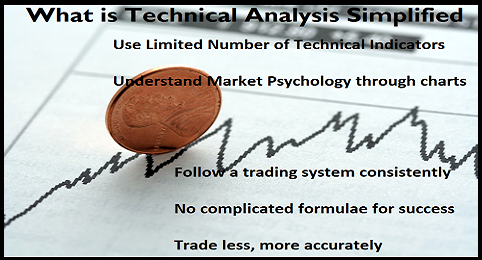 Learn to control emotions, enter or exit a trade only if it is supported by technical analysis. 2. Trade as less as possible, but more accurately. How do you ensure accuracy - follow a proven trading system. 3. Do not be tempted to trade against the trend anticipating a reversal. You can do that if chart patterns / analysis says so. But please follow a scientific method. 4. Avoid trading on a heavy newsflow day. (Or trade after the market settles down). 5. Avoid chasing hot tips and news flows to enter trades. Follow your own analysis and levels to enter trades. In the long run you will be more profitable than following someone else. Our readers traded on pre-market calls for 2 days and made a profit of close to 13, 000/- this week. I will be soon back with trading ideas for next week. Today Amazon gave a very good Opening Range Breakout trade. Though the trade was risky , finally it payed off. 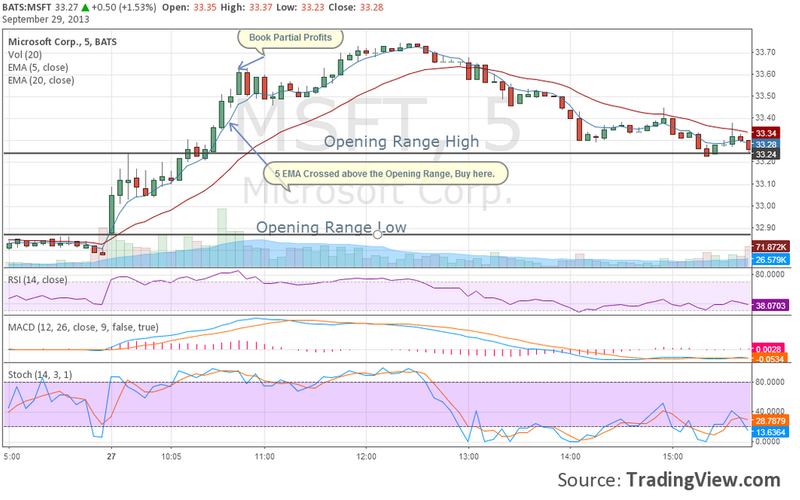 A long position was entered with a strict SL at Opening Range Low, when the 5 EMA crossed above the 30 min opening range. Please see the chart below for more details. Those who have not seen our trading course on Opening Range Breakout , please click on the link below. 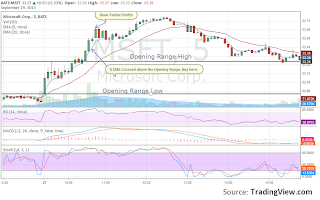 On Friday Sep 27, Microsoft gave a very good opening range breakout trade. Sharing this trade for the benefit of readers. 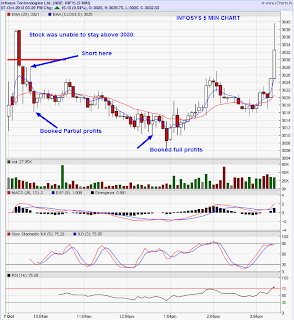 The stock made a high at 33.24 within 15 minutes of opening and then started consolidating at day's high. 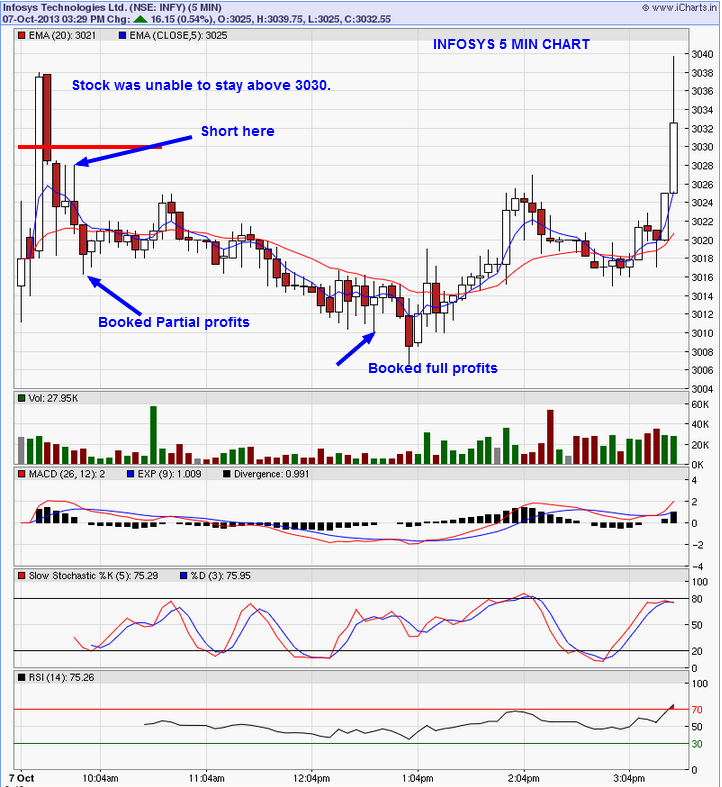 A breakout with increase in volume was observed 60 min after the market opening, giving a signal to do a breakout trade. Gave quick scalping points 33.60 and second lot at 33.70. 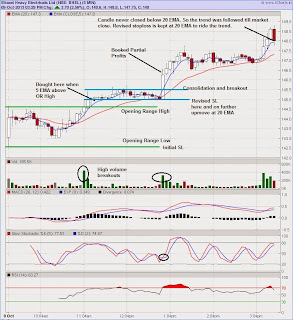 To learn more about Opening Range Breakout System for day trading, please visit our trading course. We had 3 out of 5 calls success. Two of our Auto picks for day trading rallied quite well. Hope readers enjoyed the calls. Today we had 3 out of 4 calls in profit. Please review the results below.